Creating and growing a basic herb garden requires minimal effort and you don't have to be a master gardener to have success. 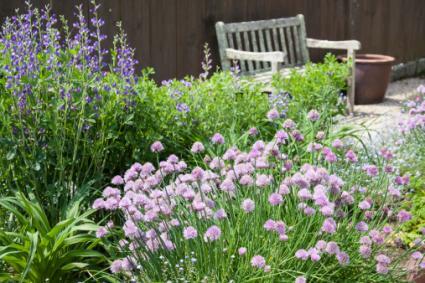 Whether you are growing herbs for their ornamental, culinary or aromatic properties, adding an herb garden to your landscape makes an attractive and a useful addition. Your herb garden will be flourishing and rewarding you with its bounty before you know it. Tea garden - Growing herbs such as mints used to flavor drinks. 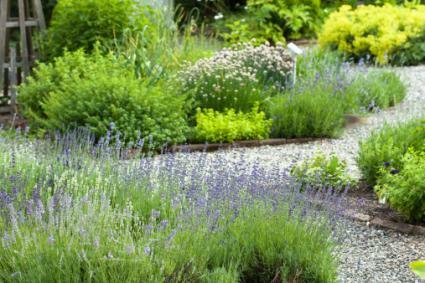 Scent garden - Growing herbs known for their aromatic value such as rosemary. Kitchen garden - Growing herbs commonly used to flavor foods like sage and dill. Italian garden - Growing herbs flavoring Italian dishes like basil, oregano, and thyme. Mexican garden - Growing herbs flavoring Mexican dishes like cilantro and cumin. 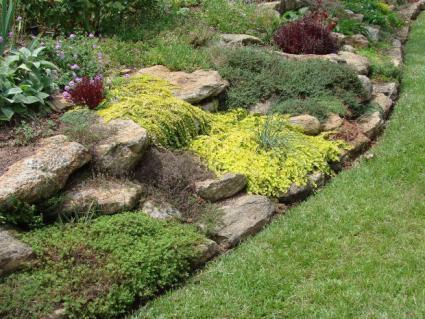 Most herbs prefer the same conditions, so planting them in the same garden area shouldn't be a problem. However, some herbs, such as rosemary, are perennials and some herbs, such as dill, perform as annuals. When planting the garden, keep the perennials in one location and the annuals in another, so when tending the garden and changing out plants the perennials aren't disturbed. The site of your herb garden can be in a separate bed designated specifically for the herbs, along a walkway, or next to a vegetable garden. To make tending the area easier and more convenient to get to, you might consider placing it close to the house, providing the area provides the preferred growing conditions. 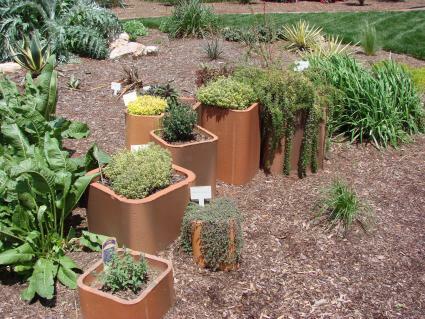 Mixing herb-filled containers among the plants growing in the ground also adds interest to the garden area. Whether growing your herbs directly in the ground or in containers, there are basic cultural conditions required for healthy and vigorous growing plants. When selecting an appropriate spot for the herb garden, light conditions are a very important consideration. Most herbs grow best in sunny locations that receive at least 6-hours of daily sunlight. For the best growth and performance, grow your herbs in fertile soil that drains well and with a pH between 6 and 6.8. If your soil is poor and lacks nutrients, amend with compost or well-rotted manure before planting. Of course, you want your garden area to be free of grass or weeds, so be sure to clean the garden area first and keep it weed-free. When amending the soil to make it richer, add a 6- to 8-inch layer or compost or well-rotted manure spread evenly over the garden area. Work the organic material into the soil to a depth of approximately 12-inches and water the area well. Prepare the area one to two weeks before planting the herbs. The frequency of water needs depends on the local weather conditions. Most herbs grow best with regular water applications to keep the soil moist but not soggy. When conditions are hot and dry, the herb garden may require daily water applications to keep the soil from fully drying out. You can test the soil's dryness by sticking your finger into it and if the top inch is dry to the touch, apply water to the garden. To prevent fungal problems and diseases, try not to splash water on the herb's leaves when irrigating. Use a drip irrigation system in the herb garden or apply water directly to the soil surrounding the plant. Fertilizers used for general vegetable gardening is suitable used in herb gardens planted directly in the ground. Apply the product in springtime and water in well. If you heavily harvest any herb, you can apply another light dose of fertilizer to help promote new growth. Applying too much fertilizer too frequently cuts down on the essential oils the herb produces. When it comes to nutrition for herbs grown in containers, use a water-soluble blend suitable for vegetables. Apply to the container every other week when watering. Due to the essential oils contained in most herbs, pests aren't usually a problem. However, aphids and spider mites can plague herbs, especially when there isn't adequate space between multiple plants and conditions are dry. Usually, spraying the herbs with a strong blast of water dislodges the pests. Once you've prepped the area so it's ready for your transplants or seeds, it's time to layout your herb garden and plant. When laying out your plants, it's always a good idea to situate your tallest growing ones in the back or center of the garden and work your way toward the front or sides with the shortest herbs, depending on the garden bed's design. This creates a tiered effect and flows smoothly. 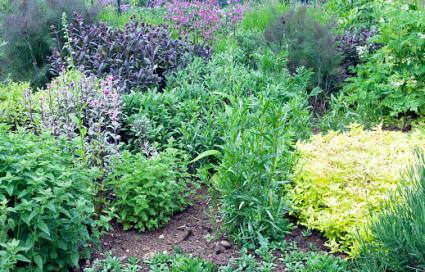 To add interest to the herb garden, mix different colored foliage or textures next to each other. For example, plant gray foliaged sage close to green or purple foliaged basil. If adding containers to the herb garden, consider using different shaped and colored containers that help accent the area and draw the eye's attention to the garden. When planting your herb transplants or seeds, always pay attention to the plant tag or seed packet. It contains information on the mature size of the plant, so you know the necessary spacing requirements, planting depth for seeds and days to germination. If using herb transplants, always plant no deeper than the transplant is growing inside the container. Once you have planted the transplants and seeds, saturate the soil with water. Appropriate spacing between multiple herb plants is necessary to prevent pest, disease and fungal problems and allows for proper air circulation. Always space multiple plants according to their potential mature size and thin seedlings following the same rule. Most herbs are perfectly happy growing in containers, provided you meet certain conditions and their cultural needs. Consider the container's material, as it will let you know how frequently you will have to water. Porous materials such as terra cotta and wood allow the soil to dry out quicker than nonporous materials like plastic, requiring more frequent watering. A good habit to follow to know if the potted herb requires water is to stick your finger into the container's soil every day or two and if the top inch is dry, apply water until it runs from the bottom drain holes. You also want to make sure whatever container you use drains, or the herbs will rot and die. Use a fertile potting mix that drains well, when growing herbs in containers. If desired, you can blend a slow-release fertilizer into the soil at the time of planting. When it comes to the size of the container needed, always consider the mature size of the plant. Many annual and small-growing herbs grow well singly planted in 1-gallon pots, however, large-growing herbs require bigger containers, such as a 3-gallon. If growing several small-growing herbs together to create a potted herb garden, you may need a 5-gallon container to allow the needed space for healthy growth and prevent overcrowding. Sweet basil: Sweet basil (Ocimum basilicum) is an aromatic and a hardy annual herb used in many culinary dishes. It makes an attractive addition to containers or grown directly in the garden and can grow over a foot tall at maturity. Use the leaves fresh or dried. Coriander/Cilantro: Coriander and cilantro (Coriandrum sativum) both come from the same aromatic annual plant. The leaves are cilantro and the seeds are coriander. For the best taste, use the leaves while young. Flowering occurs during summer and then the production of seeds happens. Cumin: Cumin (Cuminum cyminum) is a small-growing annual herb belonging in the parsley family and needs a long period of warm weather to produce the flowers and seeds used in culinary dishes. Once the seedpods turn brown, they are ready for harvesting and using. Dill: Dill (Anethum graveolens) has various uses in flavoring culinary dishes like dill pickles. The annual resembles fennel in its growth habit and description. Use the tops, foliage and stems fresh or dried. Dill doesn't always transplant well, so starting seeds directly the garden and thinning to 12-inches is best. Lemon balm: Belonging in the mint family, lemon balm (Melissa officinalis) performs as a hardy perennial growing up to 2-feet tall and wide. Its lemony-scented foliage and young stems add flavor to beverages and foods. Use the foliage fresh or dried. Mint: There are several commonly grown mints (Mentha spp. ), that are robust perennial growers in the garden. Peppermint (Mentha piperita) and spearmint (Mentha spicata) are two low-growing types you are most likely to find in garden centers. Plants produce runners and can quickly become invasive, so to keep the plants under control, you might want to plant them in containers. The small leaves and flowers used dried or fresh, flavor beverages and foods. Oregano: Another relative of mint, oregano (Origanum vulgare) is a hardy perennial. It works well used in containers or grown directly in the ground. The foliage is aromatic and used fresh or dried to flavor foods. Rosemary: Rosemary (Rosmarinus officinalis) grows as a tender perennial shrub that can reach up to 6-feet tall and wide at maturity. It belongs in the mint family and makes an aromatic addition to herb gardens and is drought-tolerant once established. Its flowers, stems, and leaves have various culinary uses both fresh and dried. Sage: Belonging in the mint family, sage (Salvia officinalis) grows as a perennial, but many gardeners grow it as an annual herb. Its grayish foliage is an eye-catching and aromatic addition grown among green-foliaged herbs. It usually produces purplish flowers in summer during the second year of growth. Use the leaves fresh or dried in various culinary dishes. Thyme: Thyme (Thymus vulgaris) is a perennial herb often grown as an annual. This member of the mint family has a shrubby habit, producing smallish, greenish-gray foliage and purple flowers, both of which are useable dry or fresh. The herb is well-suited for potted growth and tolerates drought once established. Nothing beats the taste and smell of freshly harvested herbs and within a few months, all your work will start to pay off as you begin harvesting your bounty. It is best to harvest during the cool morning hours and not during the heat of the day. With a little care and attention, your herb garden should reward you with its culinary and aromatic rewards for years to come.